For forecasting purposes to ensure public safety, NOAA has established three coastal flood severity thresholds. The thresholds are based upon water level heights empirically calibrated to NOAA tide gauge measurements from years of impact monitoring by its Weather Forecast Offices (WFO) and emergency managers. When minor (more disruptive than damaging), moderate (damaging) or major (destructive) coastal flooding is anticipated (not associated with tropical storms), NOAA issues either a flood advisory (for minor) or warning (for moderate or major). Less than half of NOAA tide gauges located along the U.S. coastline have such ‘official’ NOAA flood thresholds, and where they exist, the heights can vary substantially (e.g., 0.3–0.6 meter within minor category). They differ due to the extent of infrastructure vulnerabilities, which vary by topography and relief, land-cover types or existing flood defenses. We find that all official NOAA coastal flood thresholds share a common pattern based upon the local tide range (possibly in response to systematic development ordinances). Minor, moderate and major coastal flooding typically begin about 0.5 m, 0.8 m and 1.2 m above a height slightly higher than the multi-year average of the daily highest water levels measured by NOAA tide gauges. Based upon this statistical (regression-based) relationship, a ‘derived’ set of flood threshold proxies for minor, moderate or major impacts are permissible for almost any location along the U.S. coastline. The intent of this report is not to supplant knowledge about local flood risk. Rather, the intention is to provide an objective and nationally consistent set of impact thresholds for minor/moderate/major coastal flooding. Such definitions are currently lacking, which limits the ability to deliver new products as well as the effectiveness of existing coastal flood products. Coastal communities along all U.S. coastlines need consistent guidance about flooding, which is 1) forecasted in the near future (e.g., severity/depth of 4-day predictions of storm surge heights ‘above ground level’), 2) likely in the coming season or year (e.g., probabilistic outlooks) or 3) possible over the longer term (e.g., decadal to end-of-century scenarios). 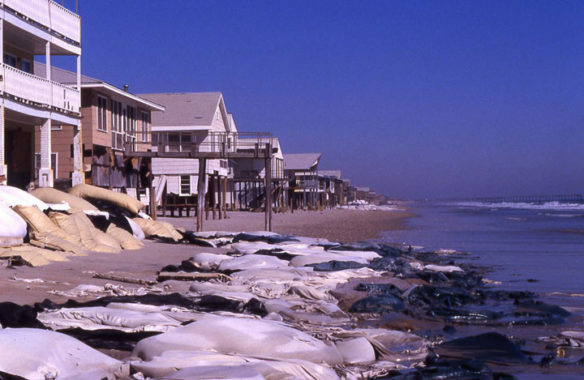 Our primary emphasis is to use the derived threshold for minor flooding, which we refer to as ‘high tide’ flooding (also known as ‘nuisance’, ‘sunny day’ and ‘recurrent tidal’ flooding), to assess nationally how exposure—and potential vulnerability—to high tide flooding has and will continue to change with changing sea levels. High tide flooding today mostly affects low-lying and exposed assets or infrastructure, such as roads, harbors, beaches, public storm-, waste- and fresh-water systems and private and commercial properties. Due to rising relative sea level (RSL), more and more cities are becoming increasingly exposed and evermore vulnerable to high tide flooding, which is rapidly increasing in frequency, depth and extent along many U.S. coastlines. Today, high tide flooding is likely more disruptive (a nuisance) than damaging. The cumulative effects, however, are becoming a serious problem in several locations including many with strategic importance to national security such as Norfolk, Virginia, San Diego, California and Kwajalein Island in the U.S. Marshall Islands. Over the last several decades, annual frequencies of high tide flooding are found to be linearly increasing in 31 locations (out of 99 tide gauges examined outside Alaska) mostly along the coasts of the Northeast/Southeast Atlantic and the Eastern/Western Gulf of Mexico, and to a lesser extent, along the Northwest and Southwest Pacific coasts. Annual frequencies are accelerating (nonlinearly increasing) in 30 locations mostly along the Northeast and Southeast Atlantic Coasts. Currently, high tide flood frequencies are increasing at the highest overall rates (and likely becoming most problematic) along the coasts of the Southeast Atlantic and to a lesser extent along the Northeast Atlantic and the Western Gulf. Between 2000 and 2015, annual frequencies increased (median values) by about 125% (from 1.3 days to 3.0 days/year) along the Southeast Atlantic, by 75% (from 3.4 days to 6.0 days/year) along the Northeast Atlantic and by 75% (from 1.4 days to 2.5 days/year) along the Western Gulf. High tide flooding is currently less problematic along the coasts of the Northwest and Southwest Pacific and the U.S. Pacific (Kwajalein Island being an exception) and Caribbean Islands for two main reasons: 1) the local height of the high tide flood threshold is above the reach of all or most of the annual highest water levels due to a combination of generally calmer weather conditions or bathymetric constraints that limit storm surge potential and 2) regionally RSL rise rates have been relatively low over the last several decades. In these locations, however, large waves (swells) and their high-frequency dynamical effects, which are generally not inherent to NOAA tide gauge measurements, can override high tides and cause dune overwash, coastal erosion and flooding. High tide flooding regionally occurs more often in certain seasons and during certain years, which is important for awareness and preparedness purposes. The seasonality in flood frequency occurs in response to a spatially varying mixture of rhythmic astronomical tides (‘tidal forcing’), repetitive seasonal mean sea level cycles and less-predictable episodic changes in wind and ocean currents that are nontidal in origin. Frequencies are relatively high during September–April along the Northeast Atlantic Coast and generally peak in October–November. Along the Southeast Atlantic and Gulf Coasts, frequencies are highest during September–November with a secondary peak in June–July. Along both the Northwest and Southwest Pacific, frequencies are highest during November–February with a secondary peak in June– July along the Southwest Pacific. High tide flood frequencies vary year-to-year due to large-scale changes in weather and ocean circulation patterns, such as during the El Niño Southern Oscillation (ENSO). During the El Niño phase, high tide flood frequencies are amplified at 49 (about half of examined) locations along the U.S. West and East Coasts beyond underlying RSL rise-forced trend increases. This predictable ENSO response may better inform annual budgeting in some flood-prone locations for emergency mobilizations and proactive responses. For example, during 2015, high tide flood frequencies were predicted to be 70% and 170% higher than normally would be expected (e.g., above trend values) along the East and West Coasts, respectively, based upon the predicted El Niño strength about a year in advance. Subsequent monitoring the following year verified that a strong El Niño formed, and flood frequencies occurred at or above the trend/ENSO predicted values at many locations. With continued RSL rise, high tide flood frequencies will continue to rapidly increase and more so simply from tidal forcing, which today is very rare. We assess future changes locally projected under a subset of the global rise scenarios of the U.S. Federal Interagency Sea Level Rise and Coastal Flood Hazard Task Force, specifically the Intermediate Low (0.5 m global rise by 2100) and Intermediate (1.0 m global rise) scenarios. Under these two scenarios, by 2050, annual high tide flood frequencies along the Western Gulf (80 and 185 days/year, respectively) and Northeast Atlantic (45 and 130 days/year) are higher largely because RSL rise is projected to be higher. Along coasts of the Southeast Atlantic (25 and 85 days/year), the Eastern Gulf (25 and 80 days/year), the Southwest (15 and 35 days/year) and Northwest Pacific (15 and 30 days/year), the Pacific (5 and 45 days/year) and Caribbean Islands (0 and 5 days/year), high tide flooding occurs less often because RSL rise projections are lower or weather conditions are typically calmer; however, the rate of increase in annual flood frequencies will eventually increase at very rapid rates. On average across all regions, high tide flooding by 2050 will occur about 35% and 60% of the times solely from tidal forcing under the Intermediate Low and Intermediate Scenarios, respectively. By 2100, high tide flooding will occur ‘every other day’ (182 days/year) or more often under the Intermediate Low Scenario within the Northeast and Southeast Atlantic, the Eastern and Western Gulf, and the Pacific Islands with tidal forcing causing all (100%) of the floods except within the Eastern Gulf (80% caused by tides). By definition, ‘every other day’ high tide flooding would bring to fruition the saying championed by NOAA’s (late) Margaret Davidson: “Today’s flood will become tomorrow’s high tide.” Under the Intermediate Scenario, high tide flooding will become ‘daily’ flooding (365 days/year with high tide flooding) within nearly all regions with tide forcing alone, causing 100% of flooding. Lastly, these results illustrate how close U.S. coastal cities are to a tipping point with respect to flood frequency, as only 0.3m to 0.7 m separates infrequent damaging-to-destructive flooding from a regime of high tide flooding—or minor floods from moderate and major floods. This suggests a particular interpretation for ‘freeboard’ and other engineering adaptive methods as the desired level of protection in terms of flood type, in both the present and future. This recognition may in turn facilitate a more systematic implementation of freeboard guidelines nationally.